The results of friction loss in industrial piping systems can decrease operational efficiency and productivity – and eventually result in downtime and costly repairs. Friction loss affects flow rate and fluid pressure within the piping system and must be considered during system design. According to the U.S. Geological Survey, power generation plants are the largest source of U.S. water withdrawals and account for about 40 percent of the total water withdrawn from various sources in the United States. Industrial facilities require reliable equipment that ensures long-term performance for maximum productivity and minimal downtime. When choosing a piping system for an industrial application such as a hydrochloric acid or sodium hypochlorite facility, specifiers must consider the joining method for a piping material and how it will impact labor costs, productivity and service life. An atmospheric tank stores liquids at atmospheric pressure. Contained in one of these vessels may be hydrochloric acid, chlorine dioxide, sulfuric acid or some other corrosive, potentially hazardous solution. Each vessel is specially designed, constructed and installed to meet the specific requirements of the plant. Once the vessel has been put into use, the job is not done. Sometimes, ideal conditions are not perfectly maintained or unforeseen events occur, causing problems for the tank. To keep plant workers safe, and to protect the large investment in the plant, inspections must be a fundamental part of the plant’s safety program. Follow a specified timeline, technique and team to avoid a costly and hazardous failure. Biological contamination presents a serious concern for many applications, even in industrial plants. Biofilm formation allows unsafe bacteria and organisms to grow and contaminate supplies of water and other transported fluids. Considering alternative piping materials ideally suited to resist biofilm formation can help minimize this significant health risk. What Does it Mean for a Pipe to be Fire Resistant? This post was originally published in November of 2017, and has been updated with more information and resources, including two burn test videos. When we talk about plastic and fire resistance, most people conjure up images of melting plastic in a campfire or bending plastic spoons with a lighter. While many plastics don’t stand up well to heat and fire (namely polypropylene and polyethylene), it’s not true of all thermoplastics. Specifically, chlorinated polyvinyl chloride (CPVC) is engineered to limit flammability and smoke production. 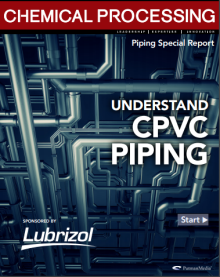 In fact, many applications that specify CPVC piping because of its heat, pressure and corrosion resistance capabilities do so because it also satisfies strict regulations around flame and smoke resistance. But what qualities should you look for in a thermoplastic piping system to ensure it satisfies your application’s fire resistance requirements? The following is an excerpt from “CPVC Use in the Chemical Processing Industry.” Download the full ebook to learn more about where CPVC can be used in the chemical processing industry, which chemicals CPVC stands up against and how CPVC compares to alternatives in various applications. The chemicals market, according to Chemical Processing, is currently worth around $1 trillion and is projected to grow to more than $5 trillion by 2022. With 40,000 existing facilities—and thousands more planned—the chemical processing industry (CPI) is becoming increasingly competitive. Broadly defined as the chemical conversion of raw materials to finished products, the Chemical Processing Industry includes the following (and much more): Traditional chemicals, both organic and inorganic Petroleum Petrochemical Refining Pharmaceutical facilities Marine support and offshore In this growing sector, plant managers and engineers seek systems that are more cost effective, reliable and specially engineered to meet their process’ demands. What is the role of piping material selection in recognizing greater plant performance and reliability?